Thomas Jefferson’s inaugural address was delivered in “so low a tone that few heard it,” but the volume of the day proved explosive otherwise. On an early spring morning described as “mild and beautiful,” the city of Washington’s artillery cannon boomed and banged in celebration of the inauguration, scheduled for noon. Parading down the muddy, swamp grass-lined streets of a capital city still under construction, and joined by an Alexandria, Virginia group of militiamen, the unit fired again at 10:00 a.m. in front of Mr. Jefferson’s boarding house, Conrad and McMunn. Another volley bellowed after Jefferson entered the Capitol building at midday to take his oath. The Marine Band, which Jefferson affectionately nicknamed “The President’s Own,” performed for the first time at a presidential inauguration and played a new composition for the occasion entitled “Jefferson’s March.” Sixteen rounds were fired by the Alexandria unit upon Jefferson finishing the oath of office to represent the number of states comprising the Union that day, March 4, 1801. A final display of firepower ended the evening, the din of the day subsiding only as the Alexandria Company crossed the Potomac to return home. Jefferson abhorred pomp and spectacle, as it intimated the arrogance of monarchy, and he believed the American president should not distinguish himself from the people. Though he could not stop the noise of the cannons, the 6’2” Jefferson did in fact wish to stand firm in his depiction of the political principles and philosophies of the American Revolution. Breaking the precedent of George Washington and John Adams, he refused to take a carriage ride to his swearing-in, instead choosing to walk up Capitol Hill via what is today known as Pennsylvania Avenue. In fact, Jefferson became the only president in U.S. history who walked both to and from his own inauguration. He also refused to wear suit or ceremonial sword, as had Washington and Adams, and instead dressed as “a plain citizen, without any distinctive badge of office.” Five or six of his fellow boarders, most of whom were congressmen, joined Jefferson on his walk. In striking contrast, the Alexandria militia detachment reveled in the pageantry and chose to walk before Jefferson with swords drawn, held high in the air. The turnout for Jefferson’s inauguration was described as “immense, the largest concourse of citizens ever assembled here” according to Philadelphia’s Aurora, which estimated a crowd of 1,140, including 154 ladies. The lady Margaret Bayard Smith, the author who penned The First Forty Years of Washington Society, later described the Senate chamber as “so crowded that I believe not another creature could enter.” Bystanders on the Capitol steps applauded as Jefferson entered the building, and despite tight quarters, members of the Senate and House rose to their feet as Jefferson entered the room to deliver his speech. Chosen by Congress to write the Declaration of Independence due to his elegant writing style, not his oratorical skills, Jefferson’s call within the Inaugural Address for a “wise and frugal Government which shall restrain men from injuring one another” resounded fervently after this particular election, which was described as “one of the ugliest in American history.” Jefferson needed to repair a fractured electorate and mend the division between the political parties of the time: the Federalists, the party of George Washington and John Adams, and the Democrat-Republicans, headed by Jefferson. 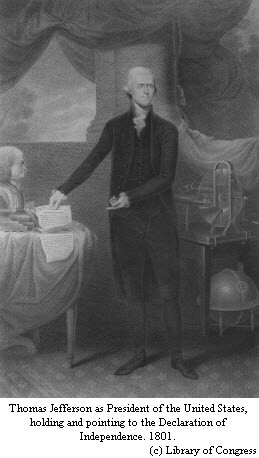 During the election, Federalists had referred to Jefferson and his supporters as “dangerous radicals,” “mad men,” who, if elected, would usher in a “reign of terror.” Democrat-Republicans accused Adams of wishing to restore the monarchy and make himself king, his followers as those “plotting to subvert human liberty and impose slavery on the people.” Unequivocally, Jefferson was charged with unifying the nation, as he became the first president to be sworn into office upon a change in party. Jefferson did not end his day at an elaborate inaugural ball, a tradition begun by James Madison in 1809. Instead, Jefferson returned to his boarding house for dinner, taking the lowest seat at the long table, far from the fire. Offered a more distinguished seat by one Mrs. Brown, Jefferson declined with a smile. When a gentleman from Baltimore asked Jefferson’s permission to wish him joy, Jefferson replied, “I would advise you to follow my example on nuptial occasions, when I always tell the bridegroom I will wait until the end of the year before offering my congratulations.” Clearly, Jefferson’s deliberate reliance on modesty and restraint, in an attempt to reunite America’s voters, indeed her people, set the tone for our nation’s first transition of political parties, ensuring the preservation of our Union. Read Milton Meltzer’s explanation as to the factor which “helped raise Jefferson to the presidency,” in “Thomas Jefferson, 1743-1826,” found in Our White House: Looking In, Looking Out. View Mike Reagan’s illustration of the initial layout of Washington, D.C., entitled “The Capital City in 1800,” within Our White House: Looking In, Looking Out. Find out more about the rise of party politics in “Choosing Sides: The Rise of Party Politics” on this website. Differing opinions as to the degree of power our Constitution granted to what Jefferson described as the “Central Government” led to the rise of political parties in the United States. Have you ever differed in opinion from a close family member or friend? How did the difference affect your relationship? How did you remain close despite differences? Jefferson earned a great degree of respect from the populace, much needed after a contentious election, as he deliberately portrayed a modest demeanor. How do you believe 21st century leaders should balance the need to both display modesty and earn respect? How do you personally balance giving and receiving within your own life? Jefferson broke with the inaugural traditions of two great leaders, Washington and Adams, for a specific purpose. Discuss a time when you broke with tradition. Did it work for the better? Did others follow your lead? The viewpoints of both the Federalists and the Democrat-Republicans contributed to the growth of our early nation. Discuss how the sacrifices of both Jefferson and Adams ensured the perpetuation of democracy. Today’s students may use digital software for the purpose of reading and interpreting maps. Visiting the Library of Congress’ “I Do Solemnly Swear…” website, specifically the page titled “Presidential Oaths of Office,” create a map which plots the settings for the oath of office since 1789. Follow the instructions for plotting Google maps on Google.com. Jefferson once said his passion was science, but his duty was politics. Using an interactive poster, discover some of Jefferson’s inventions that meet the credo: Necessity is the mother of invention. Next, look about your home and discover objects/items/mechanics which could be invented or improved upon. Create a VENN diagram that compares and contrasts Jefferson’s scientific inquiry with your own! (Within a Venn Diagram, the convergence of two circles, the student lists variable similarities within the point of convergence, and what is unique to each variable in the outside, non-converging circles). Today’s media devotes an incredible amount of airtime to the fiscal concerns of our federal government. Visit the Monticello Classroom website to review resources about letter writing. Then ask the following: In your opinion, if today’s governmental leaders could ask President Jefferson just one question about running a “wise and frugal government,” what should it be and why? Write the actual letter that should be sent to President Jefferson, using correct grammar and punctuation, of course! Brodie, Fawn M. Thomas Jefferson: An Intimate History. New York: Bantam, 1974. “Editor’s Easy Chair,” Harper’s New Monthly Magazine. 76.453 (1888): 473-4. Hayes, Kevin J. The Road to Monticello: The Life and Mind of Thomas Jefferson. New York: Oxford University Press, 2012. Knudson, Jerry W. Jefferson and the Press: Crucible of Liberty. Columbia: University of South Carolina Press, 2006. “The Papers of Thomas Jefferson, February to 30 April 1801,” Princeton University Press. 33.17 (2006): 134-52. “Address by Thomas Jefferson, 1801,” Joint Congressional Committee on Inaugural Ceremonies. U.S. Senate. 2012. 24. November 2012. “First Inauguration,” Thomas Jefferson Encyclopedia. Thomas Jefferson’s Monticello. 2012. 24. November 2012. Smith, Margaret Bayard. “The First Forty Years of Washington Society.” New York, Scribner, 1907. 12-13. Library of Congress. American Memory. 24 November 2012. “The Inauguration of Thomas Jefferson: First Political Party Transition,” Presidential Transitions: “The Torch is Passed.” The White House Historical Association. 2012. 24. November 2012.